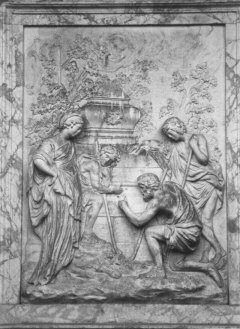 The monument contains a slightly altered version of Nicolas Poussins painting "Sheppards of Arcadia"
The code tell us that the monument was raised as a homage to a deceased person, and he is hailed as a person that is connected to the inner secret of a secret society, namely the Rosy Cross. The code and method is conformed in more than one way. The mentioned treatise on Rosicrucian codes was based on adding systematic logic positive conclusions through many hours, weeks, months, years and even decades. When applying the same successful methods to this inscription we got a positive and conclusive result. The first thing we can conclude, is that the letters can not contain important anagramas. Many professors and linguists.have suggested just that. That each letter represent a word with a special meaning. Yes, so many has done it, and all have failed! How would you finally be able to prove what words the letter represents? Why do I call it a Lottery Ticket? Thus not possible to achieve in a lifetime. Then you have the possibility that the letters represents Latin words. . . You see where this is going.... How can we ever settle for an answer. My mission was is to solve a mystery, not create one! Conclusion: The 10 letters can NOT contain important acronym information. By important, I mean information that must be preserved for future generations. If the letters had some acronym meaning for the "carver", it was not meant to be important for future generations. To get anywhere "fast", we have to be harsh, and make quick wise conclusions. If we should seek new answers from semi-truths the result would finally become useless. If we multiply thousand uncertenties by another thousand uncertainties we end up with a million uncertainties. Thats really not what we want at all. So what could the choice of letters still mean for us? What is left, if anything, must be a provable code, or even a "magic code" that could be evident and "self-proven". Do the letters have a deeper or even "magic" meaning then? And what method could be used to prove that they are deciphered correcty? Any deciphering needs proof, or even double proofs. 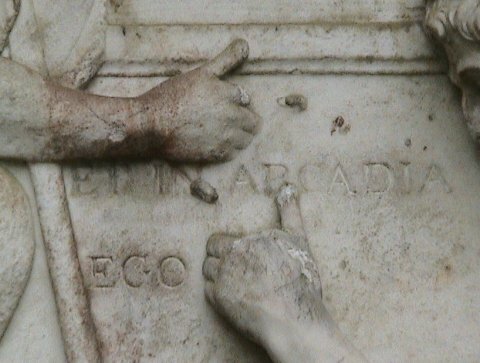 Proven in another inscription, or as in a "magic square", where the result can be "magic" thus self-proven or evident even without another figure to confirm the system. So the Shugborough inscription contains information, methods and answers that becomes evident and prove themsleves in the same way as magic numbers, when solved. The method, the cipher system and what it say, will be revealed on the date we are counting down to. But there is also another inscription in the monument. The inscription reveals a secret "encryption key" that was the inner secret and represents the origin of the ancient and secret philosophical society "Rose Cross" or the Rosicrucians. This code will be revealed in the documentary book "Two Grails", and this is the book that we seek publishers for. Rosicrucian magic and codes always contain more than one answer, thus always proving themselvs by some magic symbiosis of figures, letters and/or numbers. So does the Magic square of Albrecht Durer. 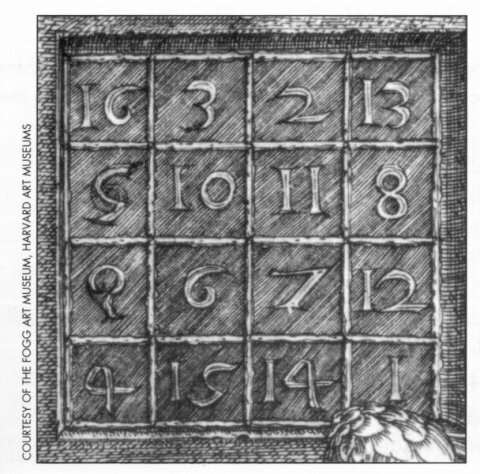 Thus there is a second secret code in the magic square of Albrecht Durer. The worlds most famous magic square contains a hiherto unpublished magic code that was discovered and proven by objctive testing in 2015. The secret code in Albrecht Durers "magic square" from his Melncolia 1 will be disclosed together with the final solution to the Shugborough inscritpion. They are both examples of how the human mind can trump the science books, and how an uncoloured and open mind together with logic and memory (IQ) can trump education. A coffin and a small pyramid on top of the coffin is added in the monument. This coffin was not appearing in the original paintings of Nicolas Poussin.